It's also easy to fake playing time. That would require effort. Which requires motivation. Something someone who has judged a game after half an hour if not liking it will only muster in extremely rare cases. Yes, but if things change and you are required to play for one hour to leave a review, it is easy just to leave something running on your computer when you grab some lunch. That takes very little effort and people will do it if it is needed. In general, only a small percentage of people leave reviews. Those are 2 indie games with highly motivated players. (both 98% positive.) It requires motivation to write a review... forcing a little in-game time is unlikely to stop someone from creating a review. You underestimate just how lazy people truly are. As a developer myself who sees a lot of interaction between support and users (and in the gaming business, too): Incredibly lazy. It is a fact one simply has to accept and deal with. 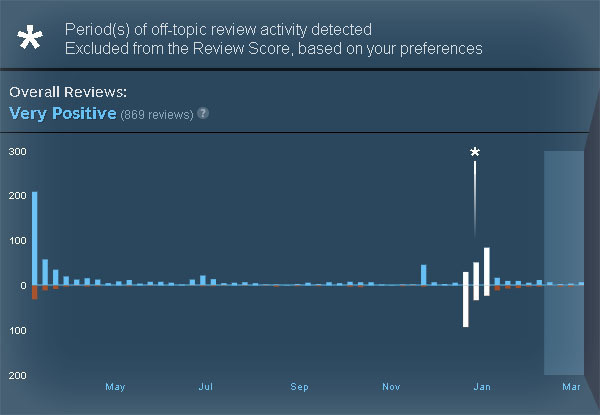 The few people that do leave short-playtime negative reviews are not highly motivated to do so, they are barely above the motivation threshold to do so. Increase the threshold and it is 100% guaranteed to decrease the number of those reviews. Obviously, a few would do shenanigans like you described, but that will only be a minority among a minority. Positive and negative reviews are also different to begin with. A positive review is almost always left after a longer time of playing (for obvious reasons), so the minimum time requirement is a non-issue here. - Review bombing because they disagree with the dev on issues not related to the game. - Bugs or other severe technical issues. - Design flaws so obvious and numerous that really only such a short time is needed to come to valid conclusions. Of those four main reasons, only the last two are truly valid in judging a game's quality. Which does make such a minimal time requirement a bit of a double-edged sword. From what I've seen over the years on Steam reviews, though, the part of the first two reasons is much larger than the last two, so I'd still be in favor of such a requirement. Alternatively, Valve could do what they do with review bombs themselves, allowing reviews at any playtime, but not making them a part of the (default) score. stretch611 In general, only a small percentage of people leave reviews. Thats true because not many people feel the urge to write their experience down so that other can read it. However, many people have a strong motivation to somehow express their frustration with something. I'd say that review-bombing is typically done by people who wouldn't write actual reviews.